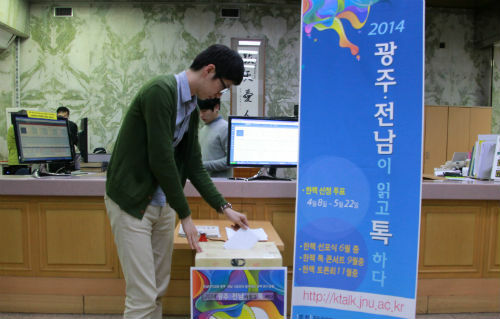 ▲ A student votes to choose the book for the 2014 Gwangju and Jeonnam Reads and Talks at the Main Library, CNU. Chonnam National University (CNU) announced 10 candidate books and is holding a vote to choose the book for the 2014 Gwangju and Jeonnam Reads and Talks (GJRT). The GJRT is an expansion of the Gwangju Reads and Talks conducted last year in order to encourage citizens to read the same book and talk to each other about the book. The Chonnam Tribune examined the results of the previous community reading project and the future plans of the GJRT in this article. 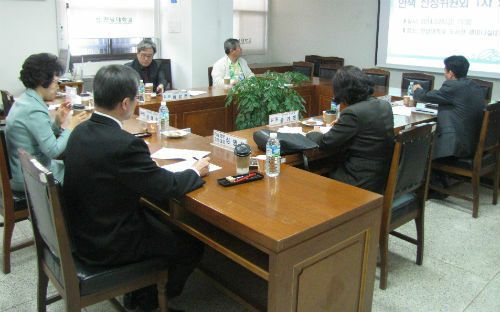 On January 9th, the Evaluation Committee met in a seminar room in the CNU Library to assess last year's project. They concluded the project achieved great success; the reading project promoted communication between Gwangju citizens from 10 year olds to 60 year olds and many reading clubs participated in the project although it was the first time. The number of participant clubs last year was 57 clubs composed of 577 people. 6464 people voted for selecting the 2013 Gwangju Book of the Year ”Letters From Exile” written by Jeong Yak-yong, a scholar in the Joseon Dynasty. 284 people attended lectures given by the author of the book and about 270 people and 240 people attended the first and second reading discussions. ▲ The Book Selection Committee composed of three professors and two public library directors chose 10 candidate books from a wide variety of genres on March 28th. The GJRT is operating in the same way as last year. In preparation for the project, on March 28th, the Book Selection Committee (BSC) including three professors and two public library directors chose 10 candidate books from a wide variety of genres. The 2013 Gwangju book of the year was a little difficult for ordinary citizens to read, so they said they have selected easy-to-read books this year. Gwangju and Jeonnam citizens can organize a reading club of about 10 and submit an application to join the GJRT by May 30th. The club members have to read and discuss the book of this year chosen by vote, and then share their thoughts about the book. All the clubs will receive an evaluation about their activities and the best reading club will get a prize in December. Also, people can attend lectures given by the author of the book in September, and participate in a reading debate competition in November. All the members of registered reading clubs can join a literature tour within this year. Local residents can vote to choose the 2014 book at the polling places available both online (www.ktalk.jnu.ac.kr) and offline (15 places including CNU Library and Gwangju Station, U-square and several places) from April 8th to May 22th. Anyone who lives in Gwangju or Jeonnam can vote for it. There will be an announcement of the book of the year for the GJRT on June 9th. Hwang Jin-ju (Freshman, Dept. of Nursing) said she wants to read many books during her school days but she does not read books now because she has no time and does not know which books are good to read. “I cannot choose good books for reading, but now I get a recommended book list selected by the BSC of the GJRT. I will read all 10 books.” Director of Central Library, Seong Ea-soon (Professor, Dept. of Korean Traditional Music) said the participation rate of CNU students was too low last year but this program is expected to make them interested in reading. Once they are motivated, they will read many books. “CNU students are also Gwangju and Jeonnam citizens. If students read many books and expand reading culture, this project will take strong roots within our society.” The Chonnam Tribune wishes that the GJRT will be successful, and that many CNU students enjoy reading books by taking this opportunity.